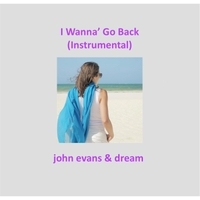 YouTube link to video of "I Wanna' Go Back"
Instrumental smooth jazz with a tropical feel. Composed and arranged by John Evans. The instrumental version of the song made popular in the John Evans & Dream YouTube video of the same name. The track features: Brady Mosher (acoustic guitar solo), Ron Jones (tenor solo & baritone sax), Larry Spencer (trumpet and flugelhorn), Gene Glover (conga drums & percussion), Mike Collier (drums), John Evans (keyboards & bass).